After thoroughly enjoying Fire & Water, Bell’s biography of Bill Everett, I eagerly awaited this first collection of early Everett comics. 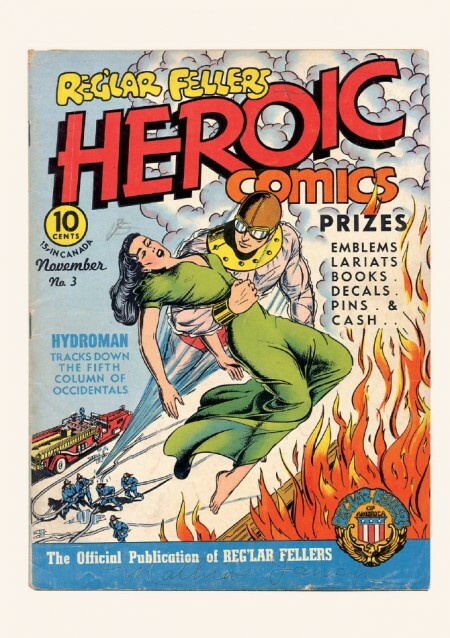 This book collects over 200 pages of this never-before-reprinted work from titles such as Amazing Mystery Funnies (1938), Amazing-Man Comics (1939), Target Comics (1940),Heroic Comics (1940), and Blue Bolt Comics(1940). 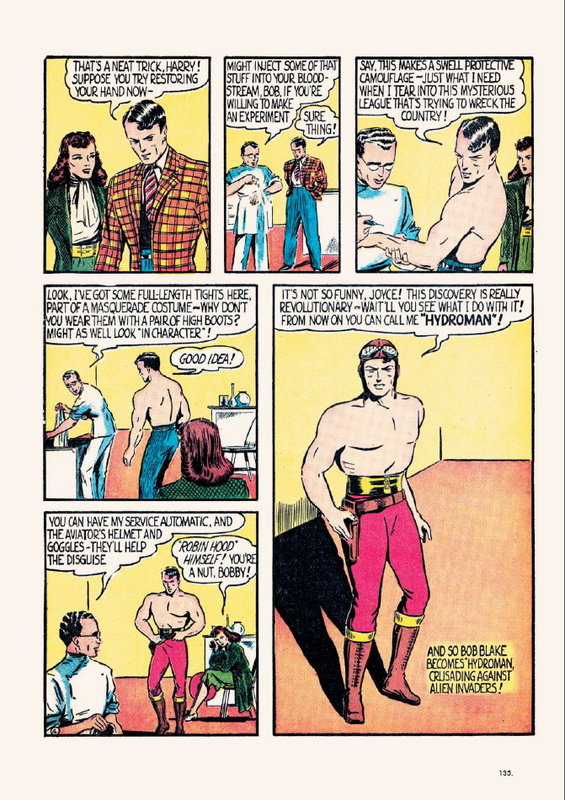 These titles feature an endless array of great vintage Everett characters such as Amazing-Man, Hydroman, Skyrocket Steele, Sub-Zero, The Chameleon, and many more, all produced by Everett’s shop Funnies, Inc. for such clients as Centaur, Novelty Press, and Eastern Color, and all displaying Everett’s brilliant cartooning and energetic storytelling. 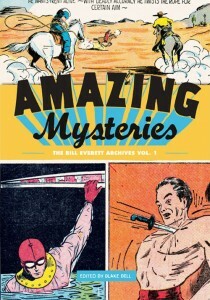 This is a wonderful collection of golden age material from Bill Everett, all never before reprinted. Two things to deal with: the material themselves and the way the material is presented. 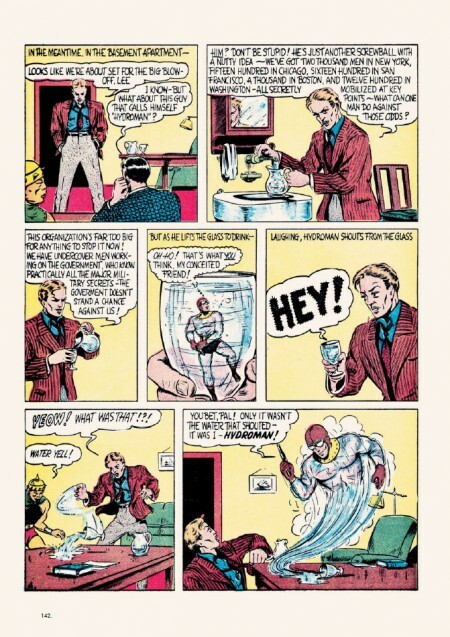 Content is made up of Everett’s work the first four years of his professional comic career. It’s an astoundingly broad collection of characters in a variety of scenarios, all of it screaming “golden age comic” as it’s read. We start with Skyrocket Steele, a Flash Gordon ripoff that shows a very green art style. Amazing-Man is a trained agent from Tibet that can turn into a green mist, while Bulls-eye Bill is your standard cowboy. 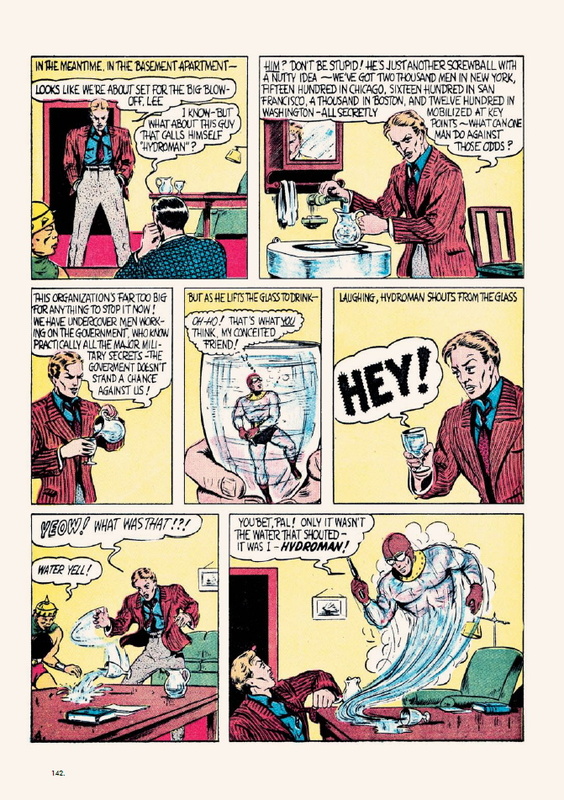 Hydro-Man can turn himself into water, and has the most facetime in the book. Read the page below to see how his costume is put together. Sub-Zero can freeze things and The Conqueror is your nigh invulnerable costumed soldier taking on the Axis single-handed. My favourite is The Music Master, who can turn himself into sound and can also control it by way of an Egyptian pan flute; I see a new career for Zamfir. Also of educational note is the history of the Red Cross. It’s a real smorgasbord of ideas, all trying to take advantage of the comics explosion at the end of the 1930s. A very nice selection of material to showcase Everett’s early career. I can’t say any of the material made me want to pursue it outside this volume. These were early attempts trying to capture a piece of the market; if it didn’t work they moved on to something else. Everett’s style and development shine through and allude to what we’d see in the future. Blake Bell has done a wonderful job on this project; it’s a thorough fit and finish. Detailed table of contents and a well-developed introduction that doesn’t rehash Fire & Water but gives insight to the publishers and work presented. Chapters broken down by material with each leading with a one page summary headlined by the most bizarre or out of context quote; Hydro-Man leads with “Good grief, Bob! Harry just blew off his hand in an explosion!..Say Joyce, that’s bad!”. Bell knows his material and its early rough-hewn development, embracing it for what it is. It finishes off with some illustrated prose pieces and cover roughs. The reprints themselves fall into covers and interiors. The covers are presented as is, direct scans with bent edges and spine wear. Interiors are cleaned up and crisp; a solid effort. I would have appreciated a paragraph or two about the restoration work required, but that’s my only complaint. 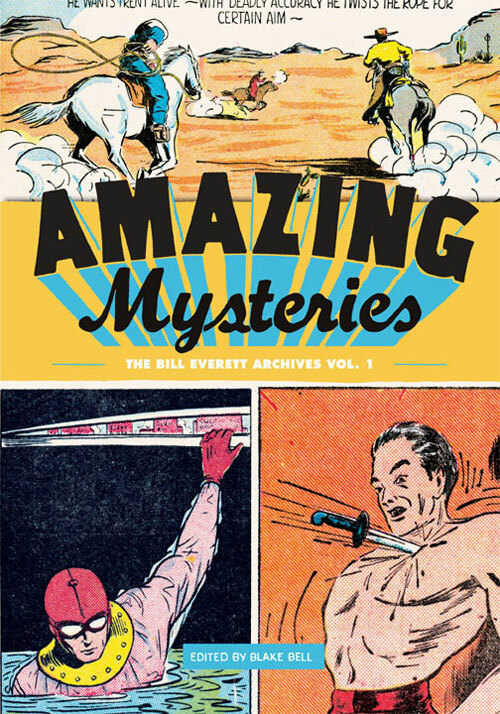 For fans of golden age material or Bill Everett Amazing Mysteries: The Bill Everett Archives, Vol. 1 is a must have look at early comics from lesser known publishers and as such is a niche product. At $40 it’s an investment into rarely seen material.